Don't miss Season 4 premiering Friday, November 6 at 8/7c on FOX! 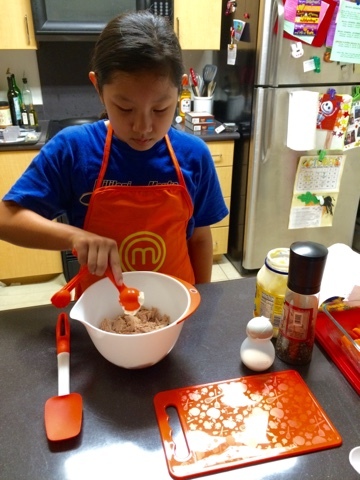 Disclosure: MasterChef Junior Inspired Cooking Sets was provided complimentary for review purposes. All opinions are entirely my own. 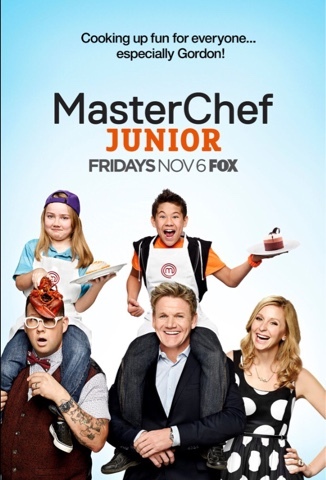 MasterChef Junior is back for a 4th season and premieres Friday, November 6 at 8/7c on FOX! My kids and I watched a clip of the show and were so excited to watch 24 of the best junior home cooks in America take on their first challenge. We all have our favorites and we can’t wait to see the winner of the first episode! The MasterChef Junior judges this season are award-winning chef Gordon Ramsay, acclaimed chef Graham Elliot and Christina Tosi, of Momofuku Milk Bar fame. In celebration of Season 4, MasterChef is also launching a new line of MasterChef Junior Inspired Cooking Sets for kids! 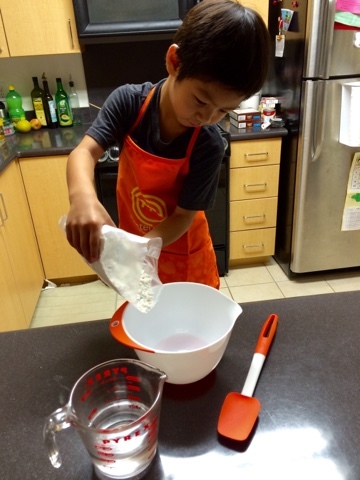 While the cooking set is definitely perfectly sized for kids, they are not toys. 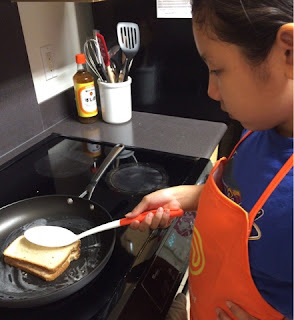 The cooking tools have proven themselves chef worthy in the kitchen when tested by both of my children. The set includes a mixing bowl, measuring cups and spoons, cutting board, tongs, spatula, ladle, apron, and even recipes to inspire your child. 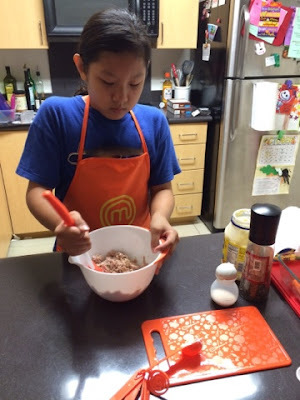 My children and I enjoyed looking over the recipes together and discussing what we wanted to cook up. This set is great as a family activity! 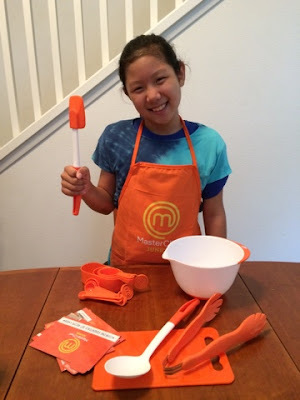 After using this set, my children have more confidence in the kitchen and hopefully will be encouraged to get more involved in the daily preparation of meals. 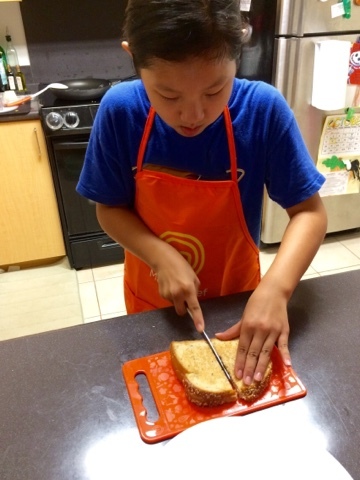 After looking over the recipes included in the set, we decided to make a variation of the grilled cheese and make grilled tuna and cheese sandwiches. Here she is measuring out some mayonnaise to add to the tuna. The spatula is perfectly sized giving her better control over mixing. 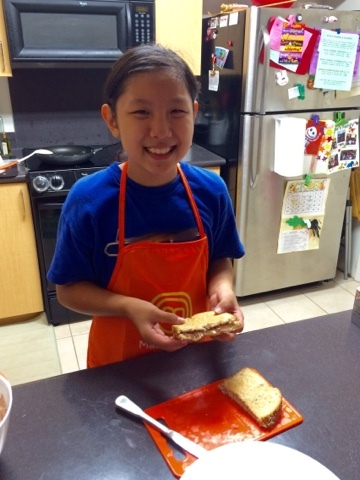 She's grilling the sandwiches like a pro under my adult supervision. Ready to cut and serve! Delicious! Now I've got a chef in the kitchen! My son didn't like being left out so insisted that I let him help with dessert. 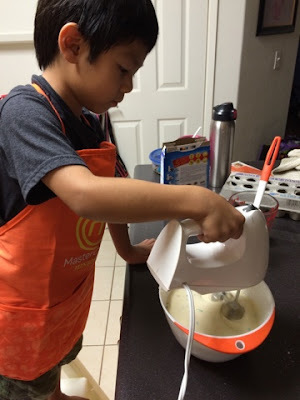 The great thing about the MasterChef Junior Inspired Cooking Set is that it is versatile and you can use it for baking too! Yay for my little pastry chef! 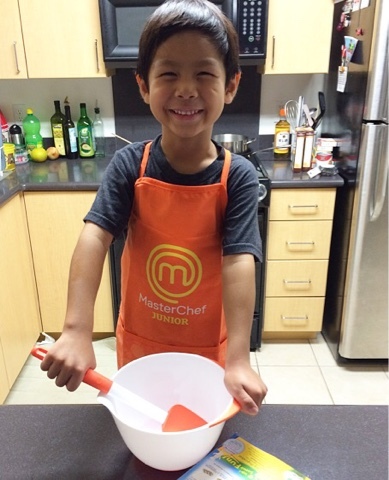 Thank you MasterChef Junior! 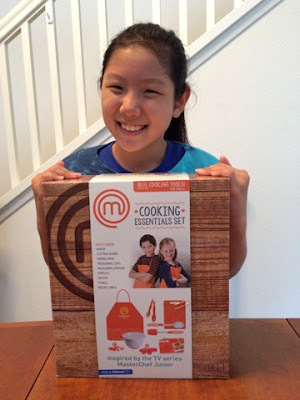 The whole family loves the cooking set! MasterChef Junior provided me with MasterChef Junior Inspired Cooking Set to sample.